Add. MS. 28,583, f. 310. B. M.
319. Substance Of Letters Of Micer Mai, 3 July. Has spoken to the auditors Capisuches and Simoneta. The former said that if the Emperor wished to reward him, he should give the reward to cardinal Cesarino, his cousin. Simoneta was ready to take a reward himself. The English have revoked the protectorship held by Campeggio, and have not yet given it to another. The process of the cause of England is in the hands of the relator. It cannot be despatched before the vacation, unless a commission is obtained to continue it in spite of the holidays. Harl.MS. 3881, f. 31. B. M.
321. Richard Layton, Priest, to Sir Will. Paulet. In behalf of two parishioners and others belonging to the chapelry of East Farnham, Hants, who had procured an acre of ground for a churchyard, but as they have not the King's licence of mortmain to exhibit to the chancellor their ordinary, it cannot be consecrated. London, 4 July. Hol., p. 1. Add. : To the right worshipful Mr. Pawlett, controller of household to the king's Grace. 322. 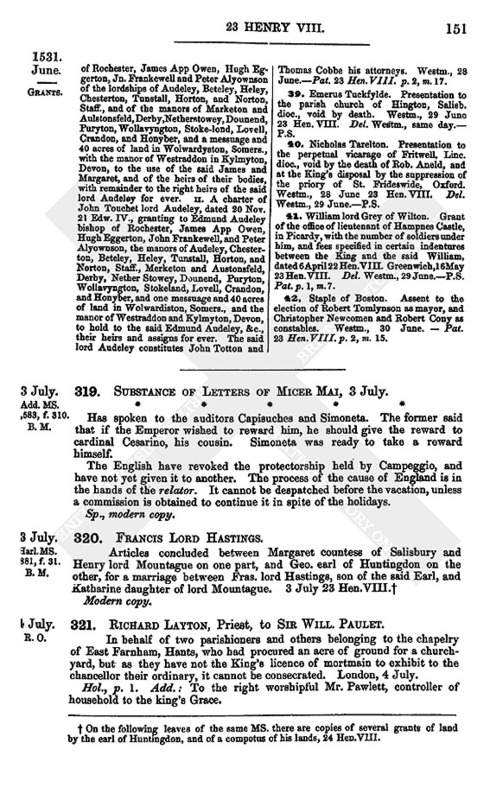 The Prior, Subprior, &c. Of Malmesbury to Henry VIII. Received on the 3rd his letters, showing that the King had been informed that there had been great variance among them as to the election, and had sent Dr. Lee to them to signify his pleasure. They are in perfect concord; and Dr. Lee, who has been with them twice, has not declared the King's pleasure so largely as was done today by Sir Edw. Baynton, steward of the monastery. Are content, accordingly, to send by Baynton or Dr. Lee the names of four brethern, that the King may choose one. Bromham, 5 July. Signed : John Codryngton, prior Dan John Gloceter, subprioure Dan Water Brystowe, coffurerDan John Calne, fermerer. P. 1. Add. Vesp. F. XIII. 91 b. B. M.
323. G. Earl Of Huntyngdon to Cromwell. Thanks him for his kindness. Desires him to continue good master to the bearer, his servant, whose annuity he excepted in his bargain with Sir Wm. Compton. Thinks that Cromwell knows how the escheator's quest would have found. Asks him, therefore, to help him to enjoy what the Earl gave him. 5 July. Hol., p. 1. Add. : To, &c., Mr. Cromwell, one of the King's most honorable council. Cal. B. I. 298. B. M.
324. Sir David Lyndsay to the Lord Great Secretary Of Scotland. Came to Brussels, 3rd July. Had audience of the Emperor three days after, and got good expedition of his principal charges. The old alliances are confirmed for a hundred years. Has sent a duplicate of the confirmation to the Conservator. Will bring another with him to Scotland, both under the Emperor's great seal. Has delivered the counterpart, under the great seal of Scotland. Don Peder de le Cowe, to whom he delivered the Secretary's writings, showed him great kindness, but did not remain in the court long after he came. Sends his answer by bearer. Remained in the court over seven weeks, on the matters of the merchants. When he came it was reported that the Scotch king was dead. The queen of Hungary enquired if it was true, and rejoiced to find it was not. Was told that the Emperor made all the "kirkmen" in Brussels pray for his soul. The news came from England, and was believed till his arrival. It would be too long to write the triumphs that have been celebrated here. Jousts, tournaments, fighting on foot, "in barras," and the names of the lords and knights wounded at the Great Tournament, he has written to show the King on his return. The Emperor intends leaving for Germany, for reformation of the Lutherans, at the end of the month. The queen of Hungary remains here as Regent, "and was affermit (?) regent by the iij. estates" at Brussels on the 5th July. Antwerp, 23 Aug. Hol., p. 1. Add. : "To my special lord my lord ye gret secretar to our sowerain lord of Scotland." Endd. by Wriothesley : "Letters from David Lindsay to the secretary of Scotland." Thomas a Lee, one of the King's gunners, to be principal searcher and maker of saltpetre, with power to search and dig for the same in the King's lands and elsewhere. The said Thomas is to "replenish and make up plain" all ground broken, at his own cost, so that the owner be not injured. He is, however, authorised to hire workmen in the King's name, and to take wood for burning and trying the saltpetre, with carriage for the same by land and water, and to take any house or houses at reasonable rent, with all other necessaries and commodities for the same. Windsor Castle, 8 July 23 Hen. VIII. R. O. Pocock, II. 283. 326. Henry VIII. to Ghinucci, Benet, and Casale. 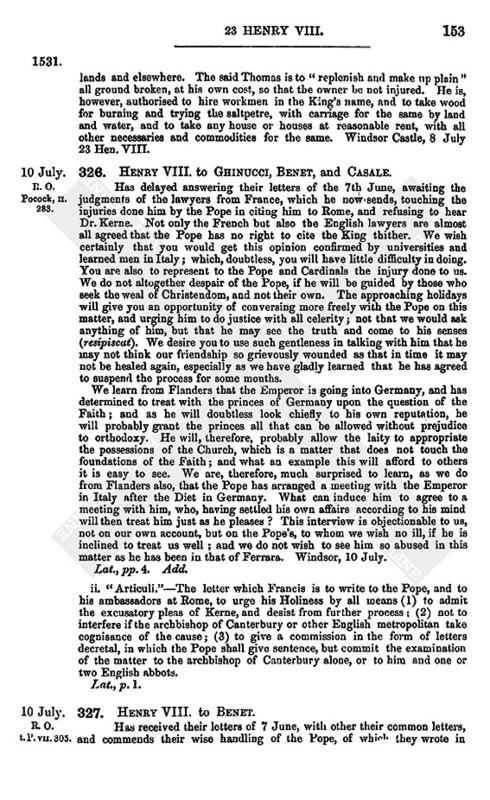 Has delayed answering their letters of the 7th June, awaiting the judgments of the lawyers from France, which he now sends, touching the injuries done him by the Pope in citing him to Rome, and refusing to hear Dr. Kerne. 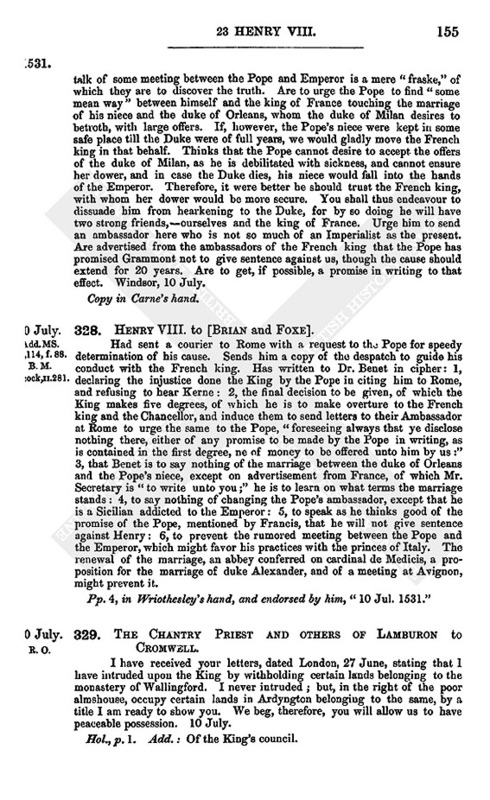 Not only the French but also the English lawyers are almost all agreed that the Pope has no right to cite the King thither. We wish certainly that you would get this opinion confirmed by universities and learned men in Italy; which, doubtless, you will have little difficulty in doing. You are also to represent to the Pope and Cardinals the injury done to us. We do not altogether despair of the Pope, if he will be guided by those who seek the weal of Christendom, and not their own. The approaching holidays will give you an opportunity of conversing more freely with the Pope on this matter, and urging him to do justice with all celerity; not that we would ask anything of him, but that he may see the truth and come to his senses (resipiscat). We desire you to use such gentleness in talking with him that he may not think our friendship so grievously wounded as that in time it may not be healed again, especially as we have gladly learned that he has agreed to suspend the process for some months. We learn from Flanders that the Emperor is going into Germany, and has determined to treat with the princes of Germany upon the question of the Faith; and as he will doubtless look chiefly to his own reputation, he will probably grant the princes all that can be allowed without prejudice to orthodoxy. He will, therefore, probably allow the laity to appropriate the possessions of the Church, which is a matter that does not touch the foundations of the Faith; and what an example this will afford to others it is easy to see. We are, therefore, much surprised to learn, as we do from Flanders also, that the Pope has arranged a meeting with the Emperor in Italy after the Diet in Germany. What can induce him to agree to a meeting with him, who, having settled his own affairs according to his mind will then treat him just as he pleases? This interview is objectionable to us, not on our own account, but on the Pope's, to whom we wish no ill, if he is inclined to treat us well; and we do not wish to see him so abused in this matter as he has been in that of Ferrara. Windsor, 10 July. ii. "Articuli. 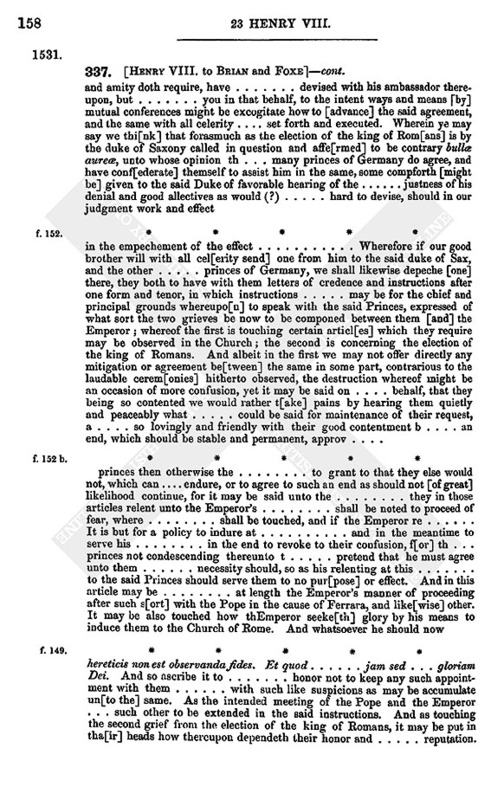 "The letter which Francis is to write to the Pope, and to his ambassadors at Rome, to urge his Holiness by all means (1) to admit the excusatory pleas of Kerne, and desist from further process; (2) not to interfere if the archbishop of Canterbury or other English metropolitan take cognisance of the cause; (3) to give a commission in the form of letters decretal, in which the Pope shall give sentence, but commit the examination of the matter to the archbishop of Canterbury alone, or to him and one or two English abbots. R. O. t. P. VII. 305. 327. Henry VIII. to Benet. 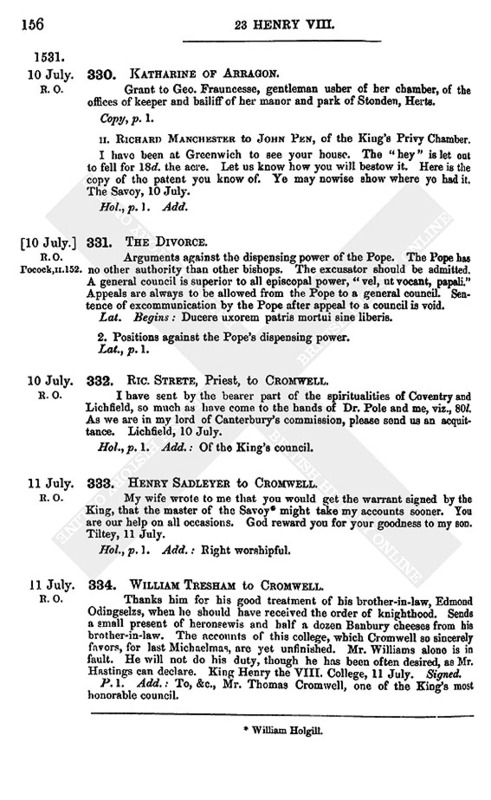 Has received their letters of 7 June, with other their common letters, and commends their wise handling of the Pope, of which they wrote in cipher. As he proffers his friendship to us, and willingness to oblige, though we know him to be a man of great wit that can fashion his communications as best suits his purpose, we think it best to accept his offers. We wish you to repair to him, and say that though he has allowed himself to be overruled by his Council, we have never doubted his affection; and now that we see some chance of reformation, though he has wronged us in the matter of Karne, contrary to the determination of the universities of Paris and Orleans, whose subscriptions we send, we should gladly accept his proffers if they agree with his deeds. You will the better be able to persuade him to admit Karne's allegations, and suspend the process during this vacation. If he urges that we should apply de loco indifferenti, you shall tell him that this is contrary to the opinion of all learned men, and take the opportunity of insisting on the illegality of the marriage, and the insufficiency of the dispensation, desiring him to hear what Decius, the great clerk of Italy, has to say upon it. As to the Queen's carnal knowledge of Arthur, you shall urge that the truth can best be discovered here, and submit to him the depositions of the nobles of this realm, with divers articles manifestly proving it. Gives the details. You shall urge that you are surprised at his friendship with the Emperor, considering what he has suffered from him, and is like to suffer, if the Emperor proceed to the Diet (at Spires), in which it is likely he will join with the princes of Germany, as they will not relent, and he has no strength, and thus a general council will be summoned, in which he would have no friends. You shall then say, ex abrupto, why should not the archbishop of Canterbury determine this matter, as that would be most expedient for his purpose, if he is afraid of the Emperor? If he says it were well done, so it were not procured by himself, you shall answer that no process would be so convenient if he did not interfere; and if the Emperor objects, you may urge the Council of Nice, ut permittat causam terminari ubi nata est. If you can obtain his promise in writing, send it to us; and if he deny it, urge it again, or offer him a sum of money in secret. But if he is so full of dread that he will not trust you with the writing, urge him that the matter must have an end, and without his consent if no other way is possible; and so urge him by some other way to commit the cause to the examination of the archbishop of Canterbury, or to the Archbishop, with some abbots conjoined with him. You shall speak highly of the Archbishop, as one who was formerly of the Queen's council, and is above 80, and has never received any benefit from our hands. We took from him the chancellorship, and in the last Parliament the probate of testaments, to the amount of 1,000 marks per annum. As metropolitan the Archbishop must necessarily intervene as judge in this matter, as no other judgment would be sufficient. With him the late abbot of Winchcombe, a man of remarkable learning and experience, who has been at Rome, and preached sundry times before the Pope; or there is the abbot of Westminster, a good old father, or the abbot of Hyde, a great clerk. And if he wonders why we desire this matter to be committed to abbots, you may say that the Bishops have been for the most part of counsel on one side or the other. Gives instances. If after long sticking this cannot be had, propose that the matter be committed to the bishop of London, or the Almoner, named by us; one to be named by the Queen, the Archbishop to be named by the Pope, the fourth by the French king. The commissioners to sit at Calais, or, if this is not granted, have the cause committed to the upper house of the clergy,speaking as of yourself. If he objects to the bishop of London because he solicited for us the learned men in Bologna, say he will be countervailed by the Queen's nominee. He is to be earnestly pressed in these matters, and told if he will have his laws observed he must observe our privileges. Thinks that the talk of some meeting between the Pope and Emperor is a mere "fraske," of which they are to discover the truth. Are to urge the Pope to find "some mean way" between himself and the king of France touching the marriage of his niece and the duke of Orleans, whom the duke of Milan desires to betroth, with large offers. If, however, the Pope's niece were kept in some safe place till the Duke were of full years, we would gladly move the French king in that behalf. Thinks that the Pope cannot desire to accept the offers of the duke of Milan, as he is debilitated with sickness, and cannot ensure her dower, and in case the Duke dies, his niece would fall into the hands of the Emperor. Therefore, it were better he should trust the French king, with whom her dower would be more secure. You shall thus endeavour to dissuade him from hearkening to the Duke, for by so doing he will have two strong friends,ourselves and the king of France. Urge him to send an ambassador here who is not so much of an Imperialist as the present. Are advertised from the ambassadors of the French king that the Pope has promised Grammont not to give sentence against us, though the cause should extend for 20 years. Are to get, if possible, a promise in writing to that effect. Windsor, 10 July. Add. MS. 25,114, f. 88. B. M. Pocock, II. 281. 328. Henry VIII. to [Brian and Foxe]. Had sent a courier to Rome with a request to the Pope for speedy determination of his cause. 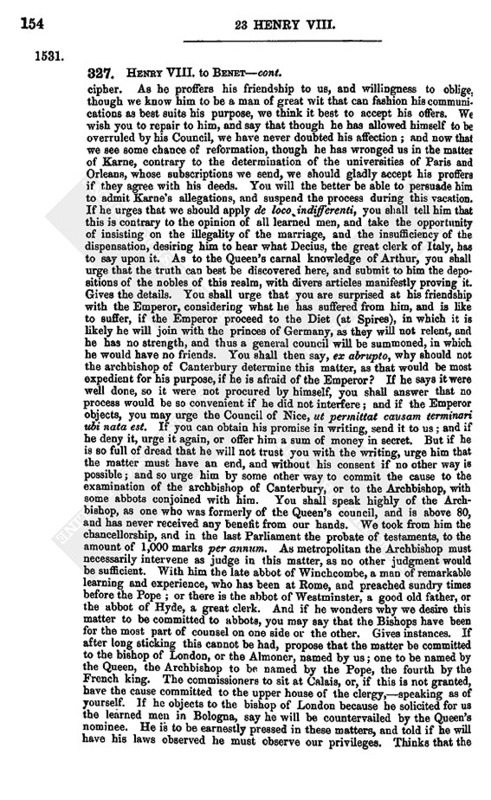 Sends him a copy of the despatch to guide his conduct with the French king. Has written to Dr. Benet in cipher : 1, declaring the injustice done the King by the Pope in citing him to Rome, and refusing to hear Kerne : 2, the final decision to be given, of which the King makes five degrees, of which he is to make overture to the French king and the Chancellor, and induce them to send letters to their Ambassador at Rome to urge the same to the Pope, "foreseeing always that ye disclose nothing there, either of any promise to be made by the Pope in writing, as is contained in the first degree, ne of money to be offered unto him by us :" 3, that Benet is to say nothing of the marriage between the duke of Orleans and the Pope's niece, except on advertisement from France, of which Mr. Secretary is "to write unto you;" he is to learn on what terms the marriage stands : 4, to say nothing of changing the Pope's ambassador, except that he is a Sicilian addicted to the Emperor : 5, to speak as he thinks good of the promise of the Pope, mentioned by Francis, that he will not give sentence against Henry : 6, to prevent the rumored meeting between the Pope and the Emperor, which might favor his practices with the princes of Italy. The renewal of the marriage, an abbey conferred on cardinal de Medicis, a proposition for the marriage of duke Alexander, and of a meeting at Avignon, might prevent it. Pp. 4, in Wriothesley's hand, and endorsed by him, "10 Jul. 1531." 329. The Chantry Priest And Others Of Lamburon to Cromwell. 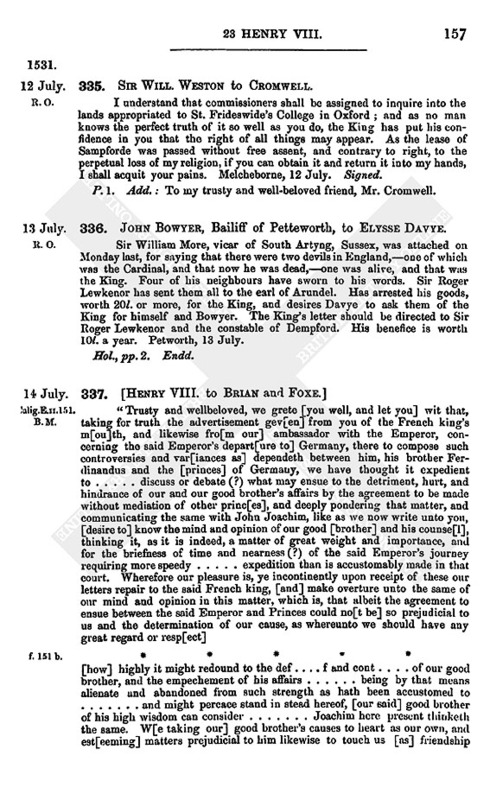 I have received your letters, dated London, 27 June, stating that I have intruded upon the King by withholding certain lands belonging to the monastery of Wallingford. I never intruded; but, in the right of the poor almshouse, occupy certain lands in Ardyngton belonging to the same, by a title I am ready to show you. We beg, therefore, you will allow us to have peaceable possession. 10 July. Grant to Geo. Frauncesse, gentleman usher of her chamber, of the offices of keeper and bailiff of her manor and park of Stonden, Herts. II. Richard Manchester to John Pen, of the King's Privy Chamber. I have been at Greenwich to see your house. The "hey" is let out to fell for 18d. the acre. Let us know how you will bestow it. Here is the copy of the patent you know of. Ye may nowise show where ye had it. The Savoy, 10 July. R. O. Pocock, II. 152. Arguments against the dispensing power of the Pope. The Pope has no other authority than other bishops. The excusator should be admitted. A general council is superior to all episcopal power, "vel, ut vocant, papali." Appeals are always to be allowed from the Pope to a general council. Sentence of excommunication by the Pope after appeal to a council is void. Lat. Begins : Ducere uxorem patris mortui sine liberis. 2. Positions against the Pope's dispensing power. 332. Ric. Strete, Priest, to Cromwell. I have sent by the bearer part of the spiritualities of Coventry and Lichfield, so much as have come to the hands of Dr. Pole and me, viz., 80l. As we are in my lord of Canterbury's commission, please send us an acquittance. Lichfield, 10 July. 333. Henry Sadleyer to Cromwell. My wife wrote to me that you would get the warrant signed by the King, that the master of the Savoy (fn. 2) might take my accounts sooner. You are our help on all occasions. God reward you for your goodness to my son. Tiltey, 11 July. Hol., p. 1. Add. : Right worshipful. 334. 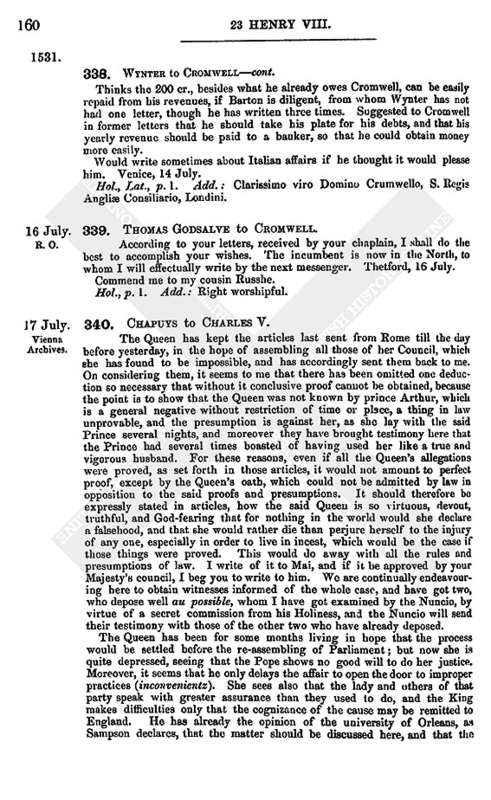 William Tresham to Cromwell. Thanks him for his good treatment of his brother-in-law, Edmond Odingselzs, when he should have received the order of knighthood. Sends a small present of heronsewis and half a dozen Banbury cheeses from his brother-in-law. The accounts of this college, which Cromwell so sincerely favors, for last Michaelmas, are yet unfinished. Mr. Williams alone is in fault. He will not do his duty, though he has been often desired, as Mr. Hastings can declare. King Henry the VIII. College, 11 July. Signed. P. 1. Add. : To, &c., Mr. Thomas Cromwell, one of the King's most honorable council. 335. Sir Will. Weston to Cromwell. I understand that commissioners shall be assigned to inquire into the lands appropriated to St. Frideswide's College in Oxford; and as no man knows the perfect truth of it so well as you do, the King has put his confidence in you that the right of all things may appear. As the lease of Sampforde was passed without free assent, and contrary to right, to the perpetual loss of my religion, if you can obtain it and return it into my hands, I shall acquit your pains. Melcheborne, 12 July. Signed. P. 1. Add. : To my trusty and well-beloved friend, Mr. Cromwell. 336. John Bowyer, Bailiff of Petteworth, to Elysse Davye. Sir William More, vicar of South Artyng, Sussex, was attached on Monday last, for saying that there were two devils in England,one of which was the Cardinal, and that now he was dead,one was alive, and that was the King. Four of his neighbours have sworn to his words. Sir Roger Lewkenor has sent them all to the earl of Arundel. Has arrested his goods, worth 20l. or more, for the King, and desires Davye to ask them of the King for himself and Bowyer. 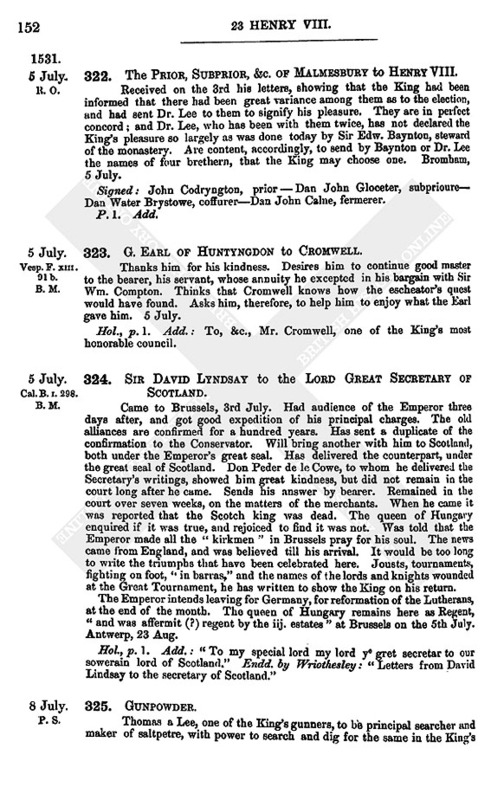 The King's letter should be directed to Sir Roger Lewkenor and the constable of Dempford. His benefice is worth 10l. a year. Petworth, 13 July. Calig. E. II. 151. B. M.
... should proceed indifferently ... de the .. be ... we and our good brother will show unto them accordingly unto the same; which matters opened to ... with good dexterity, we think, woll fac[illy cause them] to desist and forbear to condescend to the said E[mperor for] this tyme, by reason whereof he sh ... to depart thence to Spain, with diminution ... of his reputation and credit, to the furtherance and [benefit of our] and our good brother's affairs. And forasmuch as [it shall] percase chance that the said duke of Sax[ony and other] of the Princes unto whom these matters should longe (?) would use this overture to their commodity with the Emperor, [and] open the same unto him; we, foreseeing that as th[e] only danger in practising of this matter, have de[vised] no letters to be sent, but only to such as heretofore [have] written thereof unto us. And in our letters to make men[tion] only of the election of the king of Romans, whe[rein,] forasmuch as they have written unto us saying the sa[me] to be nought, we, therefore, desirous to know the truth, and as justice will so to favor or disfavor the same, have depeched our serv[ant ... to] whom we desire them to give firm credence ... and after this tenor the letters to be conceived, and no[t] otherwise, so as those our letters showed to the Emperor shall [not] make against them that shall so show them, and [be] to us nothing prejudicial; whereupon our pleasure is ye know how our said good brother liketh the gross of this matter, and what he thinketh convenient to be further done or added unto t[he] same, which our pleasure is ye signify unto us with all possible diligence, for, as he may perceive, the delay of a little time shall utterly dis[ap]point all that herein is intended. "As these letters were finished, arrived our chaplain Mr. Chamberleyn with your letters, which w[e] have read, and shall make answer unto you concerning the same shortly; but we thought not convenient to tarry this depeche, which the French a[mbassador] maketh for that matter, but we shall write further unto you within these two days, willing you to send answer of these letters with diligence. At Windsor, 14 die Jul[ii]." Nero, B. VI. 163. B. M.
Is surprised at not receiving an answer to his letters, as he earnestly desired to know Cromwell's wishes. Has written four times since he came hither, and would have written oftener but for fear of troubling him. Necessity now compels him to write. Will not know how to live unless the 200 cr., for which he has often asked, arrive before the end of August. It would be a great disgrace to sell his furniture, clothes, and books. Cromwell will not think he has spent money carelessly, if he reads his last letters, and considers what he has spent on his journey, at Padua and Venice, at inns before he could find a suitable place, in furniture, clothes, books, and house rent, and in medical treatment of George Lauson and Belson, who were in great danger. Would have sent Lauson back to England if he had had money, not because he is now disposed to sickness, but lest he should be ill again. Has more fear for Lauson than for himself. 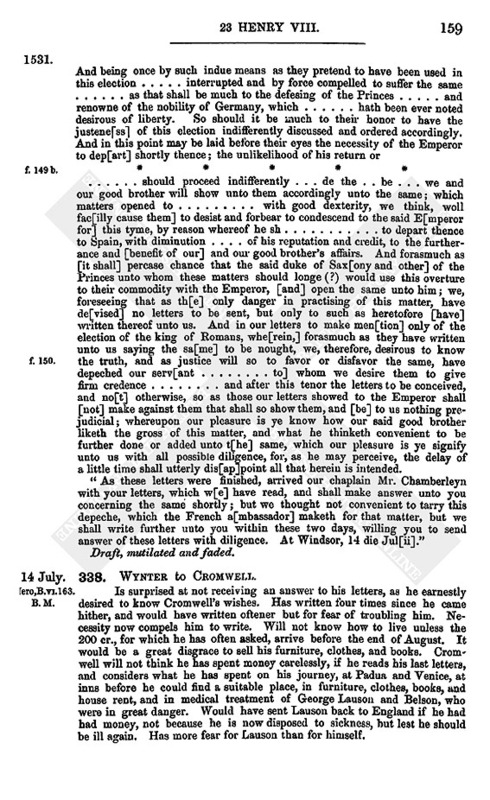 Thinks the 200 cr., besides what he already owes Cromwell, can be easily repaid from his revenues, if Barton is diligent, from whom Wynter has not had one letter, though he has written three times. Suggested to Cromwell in former letters that he should take his plate for his debts, and that his yearly revenue should be paid to a banker, so that he could obtain money more easily. Would write sometimes about Italian affairs if he thought it would please him. Venice, 14 July. Hol., Lat., p. 1. Add. : Clarissimo viro Domino Crumwello, S. Regis Angli Consiliario, Londini. 1. On the following leaves of the same MS. there are copies of several grants of land by the earl of Huntingdon, and of a compotus of his lands, 24 Hen. VIII.